SPRING is here and we’ve been blessed with some suitably warm weather in which to enjoy our extra hour of daylight, but for parents this comes at a cost. Not only do we have to drag ourselves out of bed having lost an hour at the weekend, but our offsprings’ body clocks are all over the place too. Anyone with teenagers will know how tough it is to wake them from their blissful slumber (or stinky pit, as it’s known in our house) on any given school day. But take an hour off them and everything can get a little shoutier. We’re extra tired because we didn’t go to bed early enough ourselves; they’re extra tired because they didn’t want to go to bed on time, yet alone early, and probably lay in bed texting into the early hours. The smaller ones are usually up with the lark anyway – that’s the eight and four-year-olds in our house – but even they struggle with the clocks going forward and are decidedly grumpier than usual. And those of you with babies will already be battling with routines without another spanner being thrown into the works. Poor Bloke and little Bill were on the early shift on Sunday, getting to Long Buckby by 9.15am (8.15am really) for a minis’ rugby tournament. Meanwhile I was at home with the other three, and while I didn’t oversleep, I did forget that I’d only turned half the house’s many clocks forward the night before and hence only realised the older boys’ rugby training had started too late to do anything about it. There’s one man responsible for our weird habit of mucking about with time, and his name was William Willett, and he died a year before his big idea actually came into law in 1916. He was a builder living in Kent who worked out that the nation was sleeping through the lighter hours of the summer and that everyone would be happier and more productive if we gradually moved time forward by 20 minutes each Sunday in April. Then time would be ‘given back’ the same amount each Sunday in September. His proposal was ridiculed but a Daylight Saving Bill was introduced to parliament in 1909, but was batted away before war broke out in 1914. However, in 1916 the bill was passed as a temporary wartime ‘measure of economy’, in Britain and a week later in most of Europe, although William didn’t live to see his dream become a reality. Most countries then abandoned the idea after the war, but then saw the positives it brought and reintroduced it. You may, like me, have wondered why they don’t just stick with Daylight Saving Time, or British Standard Time (BST); the lighter-houred time we are in now, all year round, therefore skipping the dismal darkness that comes after October 28. Apparently they tried it, between 1968 and 1971, to fall in line with other European countries with whom we did much of our trade. This was abandoned in 1972 because children in Scotland, by virtue of their more northerly location, were having to go to school in the dark. This is an argument still voiced today, and while many might argue that Scotland could put the clocks back and forward on its own, it is deemed too ridiculous to have to change time zones just to move across the border in part of the UK. So for now we’ll have to make the most of those longer days and wait for our body clocks to re-sync. Which reminds me, I must go and take Bonnie for her around-about-midnight visit to the loo because she’s such a deep sleeper there’s no clock that could rouse her . . .
AT the time of writing (February 6), there’s still about four inches of snow outside but we’re assuming school will be open this week. Nevertheless it may be the ice rather than snow that throws the proverbial cat amongst the (frozen) pigeons. It’s meant to be bitterly cold this week and parents should be prepared. It seems ridiculous to say but you do see children turning up at school without warm clothing. I don’t care if your children ‘don’t like wearing coats.’ You’re not their friend; you’re their adult, so insist they wear one. And if they refuse, make them walk the last couple of streets to school instead of getting a lift from door to door. My elder two seem to think that coats are an optional extra when the temperature hovering around the zero mark, but they get dragged back to stick a coat on over their school uniform. No son, your blazer just won’t cut it. I don’t care what other kids do; you’ll secretly thank me for that coat. And yes, I do tell them that they “won’t feel the benefit” if they wear coats indoors. The younger two are still, thankfully, at an age where they like a warm coat, hat, scarf and gloves, even if we do get through several every winter (only to find them cluttering up the house come the summer). I think I’ve bought at least four hats for Bonnie since November and even putting gloves on the old-fashioned string-through-the-coat-sleeves doesn’t seem to preserve them for long. 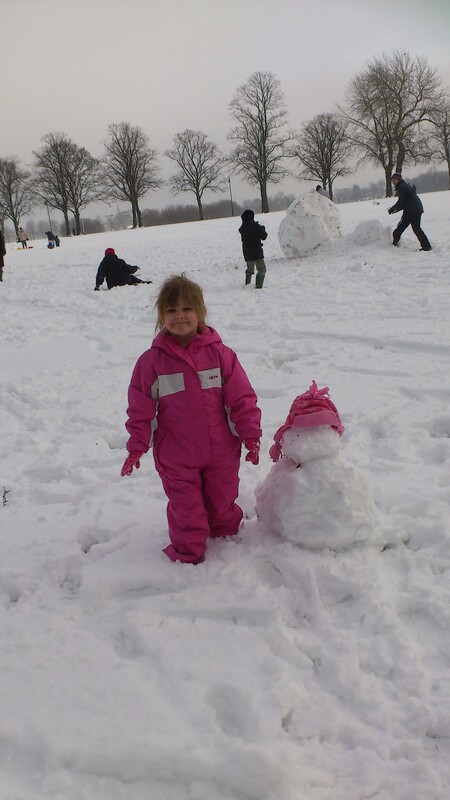 I did look around the shops for several weeks for an age-four snowsuit – not too puffy – but couldn’t find one. You may get lucky on Freecycle for coats, or by checking the charity shops. Kids can grow out of coats in a season and it can be an expensive business. Then last week I found the perfect all-in-one at Blacks up at Riverside. It was pink, waterproof, not too bulky, and £20. When the snow came at the weekend, our lot all layered up in warm coats and hats – even the boys, who know from experience the pain of a snowball hitting a cold ear or a being shoved down the neck. While Bonnie was happy to join in hurling snowballs with her brothers, she soon got bored and devoted herself to making a tiny snowman, or lying on the ground making snow-angels. Meanwhile the boys’ snowball fight descended into all-out warfare, including fortified walls both at the Racecourse and in our tiny back garden, where they trampled my plants and lawn underfoot. I’d like to tell you that Bloke and I observed maturely from a distance, but it would be a lie. Not only did we race each other inelegantly down hills on toboggans too small for our grown-up bums, but Bloke was at the heart of Sunday’s long-running snowball skirmish. And much to the disgust of our elder boys, we sneaked out to the Racecourse during Saturday’s late-night snowstorm to join other grown-ups building snowmen and running around like kids. OK, so we might not be the après-ski at Val d’Isere types, but at least we can still enjoy a bit of snow closer to home. HOW many Christmas parties have you been to this year fellow parents? One? None? The latter for me. And New Year’s Eve means staying in, watching telly. And the truth is, I really don’t mind. No, really. All those years I spent pre-kids getting neurotic about parties, the number of invites, what to wear, spending ages getting ‘ready’, only to drink too much and look like my face had partially melted by the wee small hours. Then the inevitable drunken rows (not necessarily me, but you’ll see them on every High Street), the bucket by the bed, the hangover that lasted until teatime (when you finally got up). Nah, I don’t miss it. But I am aware that in a couple of years it will be my elder sons out on the town, and there’s not a lot we can do about it but educate them, hope they don’t get into trouble, and be prepared to let them in at 4am when they’ve forgotten their keys. To those of you who are already living with older teens, I wish you a peaceful New Year’s Eve . . . THE Girl met Father Christmas this week. And despite being rather chatty and shouty in Real Life, she chose to do her ‘I’m Shy’ act. The Big Man, and Mrs Christmas, were at Billy’s school fete and had popped in to give out selection boxes or colouring books to a huge queue of excited under 10s. Billy, aged 8, went in first, on his own, and we could hear him earnestly reeling off a list of Star Wars related gift ideas. Our daughter Bonnie, aged 3, is still a little baffled by the whole Christmas thing. She’s aware that when the nights start getting dark, this Father Christmas bloke starts appearing on TV ads and everyone around her starts putting in orders for things they’d like but aren’t usually allowed to have. Her three brothers use this time of year to start making outrageous statements about things they ‘hope’ Father Christmas will bring, seeing as how they’ve been REALLY good all year. Like laptops and £100 trainers. (Never going to happen boys). Bonnie has joined in this game, by bringing home things she’s cut out of magazines on the ‘safety scissors’ table at nursery. Including the most ridiculous Princess-themed four-poster bed, complete with pink covers, cushions, teddies, pyjamas and glittery slippers. But when faced with Santa himself, she went mute. “Talk to Father Christmas darling, he’s asking what you’d like him to bring for Christmas, if you’re a good girl,” I cajoled. She smiled, held her hands to her face, and refused to speak. She took the proffered chocs from Mother Christmas and made a dash for the door. And then wouldn’t stop talking about it. Once home, she remembered another Christmas-themed clipping she’d brought home, this time with Santa on. It was an advert for the NSPCC’s letter from Father Christmas appeal. 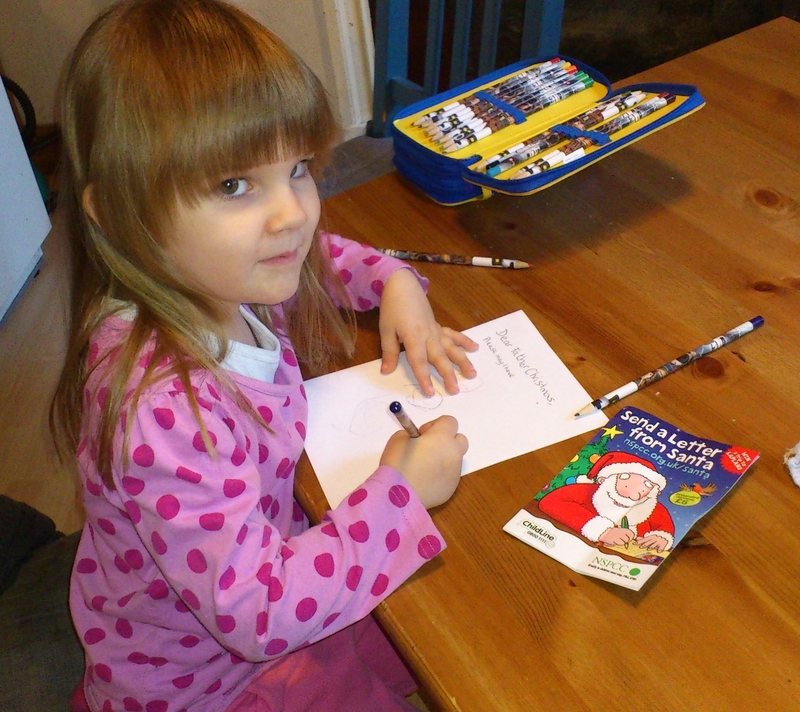 While she got busy drawing up a letter to Father Christmas explaining her real wish list that she’d been ‘too shy’ to reveal, (fairies and flowers and butterflies, on this request), I ordered her a letter from Lapland HQ, which costs just a £5 donation to the NSPCC and Childline. You get a personalised letter (which can be sent to a child anywhere in the world), with added pictures depending on their age, which even mentions their best friend. I know there are many of these ‘letters’ around but seems a nicer idea to be giving money to a charity which helps less fortunate children than just giving it to a corporation for profit. Because as we know, a lot of people have exploited poor old Father Christmas’s image and generosity to their own ends. To find out more, visit the NSPCC website at www.nspcc.org.uk and click on the Santa link, text santa to 65599 or call 0854 839 9304. 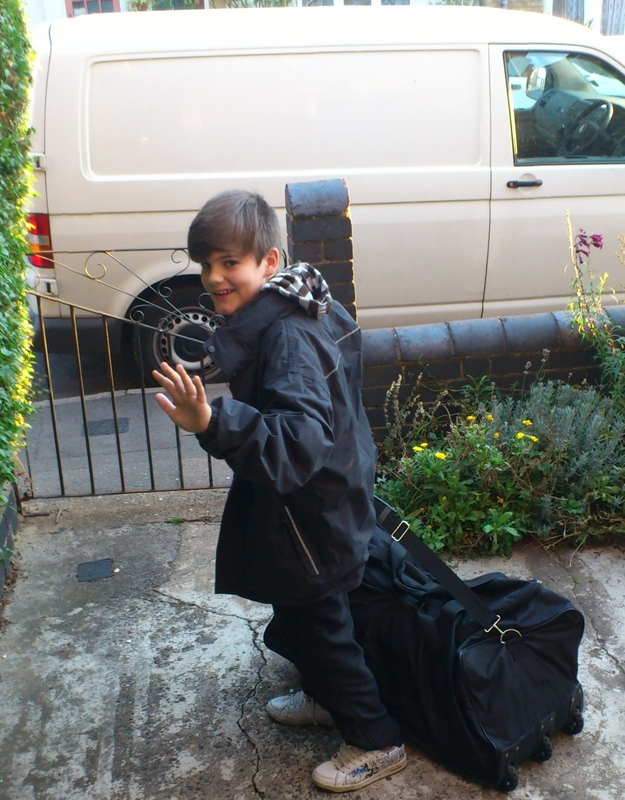 BIG lump in my throat last Monday, as our Dougie left for a school trip to an activity centre somewhere near Swindon. It was a week away where he was doing abseiling, assault courses, aeroball, archery, canoeing, climbing, fencing, orienteering, raft building, zip wires and general 12-year-old boy stuff. Meanwhile, I was fretting, quietly, to myself. (Because no one else would listen). After 14 years being a parent, I shouldn’t be fazed by trips. After all, our elder two have both enjoyed the famous ‘first nights away’ trip to Everdon and the PGL centre at Osmington Bay, Dorset, and braved the windy wilds of both Overstone and Hollowell Cub camps. But as well as the (concealed) separation anxiety, there’s the cost. We have to have a rule in our house about school trips: they chose no more than one a year and pay half themselves. It might sound hard, but we have four children and not a huge income. The kids do have to really decide how much they want to go on a particular trip. It makes them appreciate how far money has to stretch, although it does you feel cruddy when their wealthier friends are going on several trips a year. This is nothing new. Back in the health & safety-free 1970s and 80s, neither Bloke or I went on many school trips. There were always those who seemed to go on cruises and ski-trips regardless of their family’s financial background, while my most exotic destinations were to Butlins in Minehead and a one-night stay in London. I try hard not to repeat that parent mantra “you’ll appreciate it more when you’re older” because as a teen who didn’t get to go, it drove me potty. Our boys’ school has already organised 2011 trips to Tunisia, Sicily, Turkey, Cornwall and the USA. We parents were informed about Dougie’s PGL trip way more than a year ago in their first term at secondary school. Not only were we given a huge amount of notice, but also a good number of months over which to pay for it. The total cost for the week was £300, with instalments due in March, May and July, giving us time to save up. Meanwhile, the same school didn’t give anything like as much time for a planned trip to China. Yes, China. Poor Jed, aged 14, came home recently raving about the chance to go on an eight-day tour in February. The cost? £1,225. First payment of £200 immediately, with the rest in sizable chunks each month until Christmas. There’s no way we could find that kind of cash that quickly. We had heard about the epic Northampton School for Boys China trip, but hadn’t anticipated it becoming an issue until Year 11 or sixth form. Turns out the school takes them from age 14-18. Jed begged and pleaded, saying his friends were going, but we simply had to say no. If he, and we, can save, it’s something he can do in a couple of years. A great opportunity, but not just yet. So as we packed Dougie off on his UK-based adventure, my fretting started. Would he listen to instructions and not fall off the abseil tower? Would he resist peer pressure? Remember not wear the same pants every day? Don’t tell him, but I was delighted to get him back on Friday. Even though he did bring back a suitcase full of soaked and stinking clothes because he’s fallen in the river while canoeing. . .
Want to play Fifa 12 on a cinema screen? JUST a week to go before half-term and there’s a really good line up of events planned by the ‘new’ Northampton Leisure Trust. This is the band of merry sports and playleaders formerly run by the Borough Council via Lings, Danes Camp, Mounts Baths and the Forum Cinema. Now the whole she-bang has come together as a charity, and is offering events like tropical animal encounters, dodgeball, rock climbing, roller-discos and even the chance to play the new Fifa 12 computer game on the giant Forum Cinema screen! With all its bright lights, noise and smells, it gets our offspring in a frenzy when we unavoidably drive, walk or cycle past. It may say ‘only £1 a ride’, but that soon racks up when you have four kids. When I was a kid the fair only came to town once a year. So excited were the people of Great Torrington in Devon that they saved up for it. They bought new outfits for it. And everyone secretly worried that their teenage daughter would run off with the bloke on the waltzers. The fair was considered edgy and unpredictable – dangerous on more than one level. Not these days. 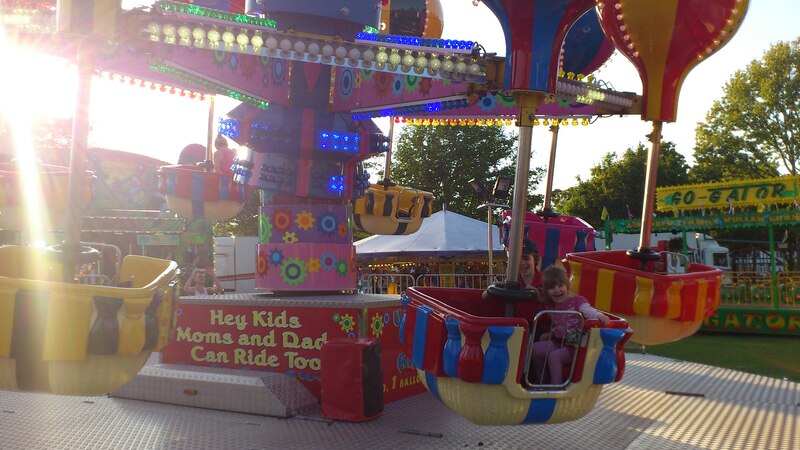 You can diary in the appearance of Northampton’s familiar family-run fair around the bank holidays. The danger comes not from the rides but from the mobile phones flying out of pockets. Do you remember not being scared of fairground rides? When does the fear take over the fun? Is it when your wallet pocket starts to hurt? NAMES in new uniform: tick. Packed lunches: tick. Bedtimes put back considerably earlier: tick. Alarms set: tick. That’s about as organised as I get for the new school term. I wish I was one of those parents with itineraries and chore charts and online family diaries. But I’m not. Our three boys returned to school this week and I think they were grateful for some order and routine. The holidays have seen far too many erratic mealtimes and bedtimes that have been entirely based on what mood Bloke and I were in. 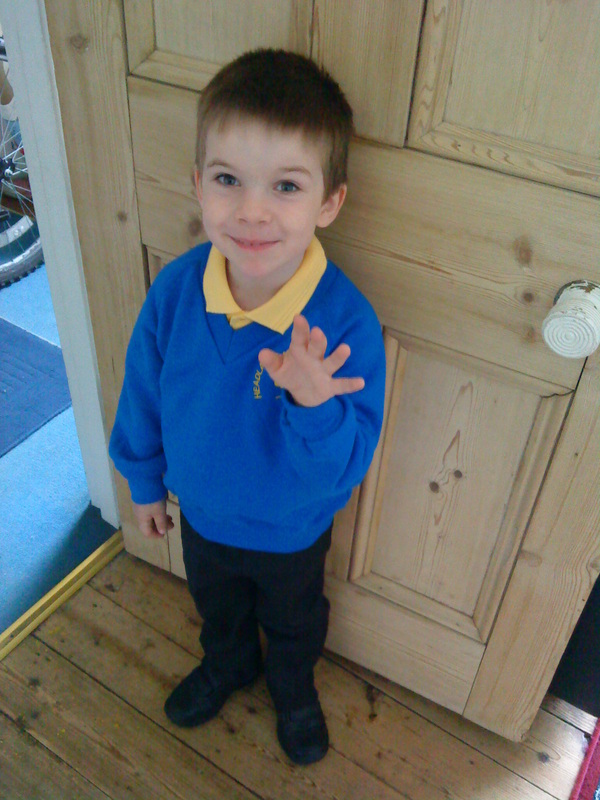 If you’re new to the world of sending your offspring to school, this is going to be an emotional week. You’ve probably been more organised than you ever thought possible, trying to ensure your son or daughter’s first days in formal education are stress-free while your own paranoia reaches epic levels. Letting them see you worry is not good. Helping them understand what is expected of them is key to getting them settled in. They want to be there on time, have the right stuff (and by that I only mean uniform and lunch, definitely not brands) and start to recognise their new routine, expected behaviour and surroundings. This is why the transfer day they had before the summer was important. All you can do once you hand them over to teacher is smile, wave and try and make it to the gates before you blub. Even though I’m ten years on from that first child, first day at school moment, I still get stressed when the new school year starts. Mostly it’s about how to get the precariously-balanced timetable of untested events slotted into place. From various school runs and fitting extra activities around normal life, it takes a good month for the dust to settle. It gets easier. Once upon a time I too spent hours sewing name tags into everything. then I discovered the speed and indeliblity of a Sharpie marker. One surname in everything, to allow for hand-me-downs. (Unless there are several families with the same name). A board of some kind is useful just to remember where the heck everyone is. We have an old Ikea blackboard that will be scrawled with the words ‘lunches’ ‘football’ ‘rugby’ ‘reading’ ‘homework’ ‘kit’ ‘swim’ ‘drama’ ‘phone’ ‘washing’ alongside the usual jumble of grocery reminders and random days of the week. Then Bonnie will fetch a step-stool and wipe it all off while no one’s looking. The first weeks are exciting. Then it all start to slip. There are going to be times when you forget things. There are going to be times when your kids forget to tell you things. There will be a lot of very tired and grumpy kids around during the next few weeks as they adjust to it all, whatever their age. Trust me, all parents go through this. You may even enjoy some time to yourself. Good luck, it’s only six weeks until half term! Make sure you check their bags for letters every night (don’t rely on them to bring things to you). Use your phone’s alarm/calendar/diary to set yourself reminders. If you have concerns, don’t try and fight for a teacher’s attention at the classroom door when he/she is trying to get 30 kids in/out. Ask at the office for a phone call, appointment or send a sealed note in your child’s bag. Establish bedtimes. It’s easy to lapse now and then, but reception-aged children need 10-12 hours sleep. Teens still need at least eight hours. Don’t be soft about this and allow habits to develop. Don’t give them the third degree as soon as you pick them up. A simple ‘What did you do today?’ may elicit an outpouring of over-information, or they may shrug and say ‘nothing.’ Don’t push it. They may talk more once they’ve eaten or heard about what the rest of the family has been doing. Do be prepared to listen to what may appear to be the most trivial event when you’re in the middle of something else. If you brush them off with “not now,” you’re cutting off communication. (Exceptions: if you are on the phone negotiating a forgotten bill, manhandling hot pans or on the loo).